A lost tribe of dinosaurs in Colorado and New Mexico may have survived the extinction of their brethren some 65 million years ago, a paleontologist suggested Tuesday. First, brethren? What is this, church? Second, that word extinction. I thought we agreed that wasn’t a real thing. A fake word. A sniglet, if you will. Third, my favorite sniglet in the world is orosuctuous. It sounds like a dinosaur doesn’t it? But it’s not. Look it up. One time, a caveman sucked a stone bowl to his mouth for a whole three minutes (cavemen were easily bored. Because they were stupid). A stone bowl! That’s orosuctastic! 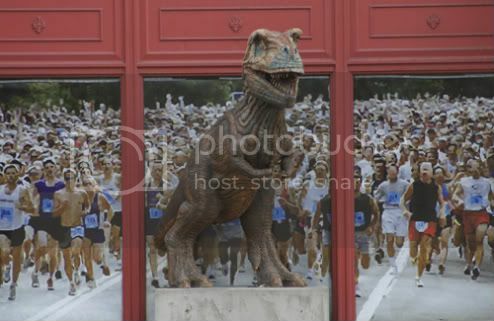 Lastly, all the proof you need that the dinosaurs didn’t die out 65 million years ago is standing on the Boulevard of the Allies right now wondering how much of a head start he should give the other runners in the marathon on Saturday. I’m thinking a good 30 minutes should make it a competitive race. Okay/Not Okay: Rex does math. 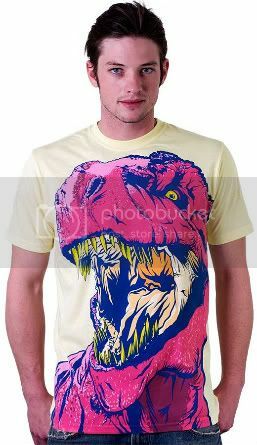 Let’s take a look at more dinosaur t-shirts that are approved by Monstrous Killer Death Lizard Rex! Look how fierce that is! If I ever see you wearing this shirt, I’ll know that there’s a human that knows the proper respect for a monstrous killer death lizard. And I probably won’t eat you because of it. This shirt is like body armor for you humans. 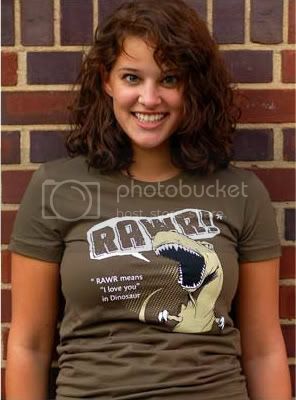 I could do without there being a stegosaurus on the shirt (stegosauruses are dweebs, in case you’re wondering), but otherwise, it’s a perfectly okay shirt. Thanks to Paul in AIP’s accounting office for finding this one. There’s a certain math to these things. Human + dog + leash = happy dog. Human + cat + leash = funny. Dogs > cats. Cat + dinosaur = ptewie! = yucky taste. Humans < dinosaurs. 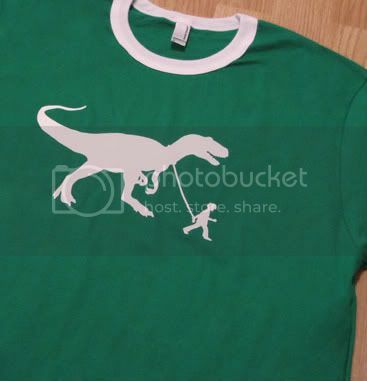 Human + dinosaur + leash = dead human. That’s MY math, at least. You will never ever ever see a human leading a dinosaur by a leash. Ever. Unless the human has promised the dinosaur a six pack of allosauruses for its cooperation, then maybe you’ll see a dinosaur on a leash. Allosauruses are hard to come by these days. 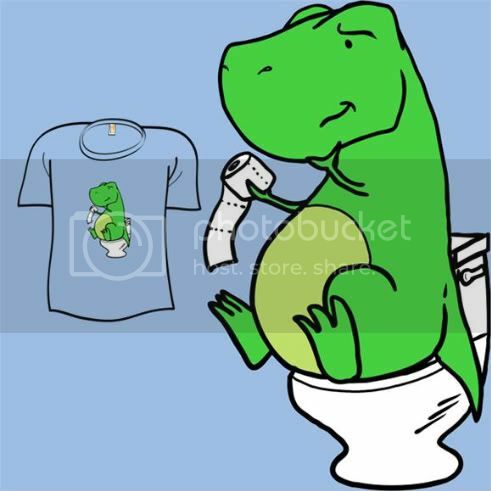 Here’s some more math for you: Designer + design with a t-rex holding toilet paper and trying to figure out how to reach his bum using his tiny little arms = designer with roll of toilet paper shoved in mouth by offended monstrous killer death lizard. Asking for it with please and a cherry on top. Yesterday, just before lunch time, I walked into the student lounge here at AIP looking for my running shoes. Some [redacted by Norm] had Barney playing on the TV. I’m not making that up. I love you, you love me, we’re a happy family [gag] Barney. The purple freak of joy. The biggest, smelliest [redacted by Norm] of [redacted by Norm] that ever [redacted by Norm] who can [redacted by Norm] for all I care. As an expert wrangler, I spent the better part of the day yesterday chasing down a snack for you. Despite his penchant for tranqing me for no good reason (sometimes, things need to be stomped, Norm. It’s the law of nature.) and despite his penchant for dressing me so ridiculously it makes my eyes roll back in my head, sometimes Norm is awesome. Look what he caught for me! I’m going to set this thing free full-speed down the Boulevard and then pretend it is a fleeing and weeping velociraptor. 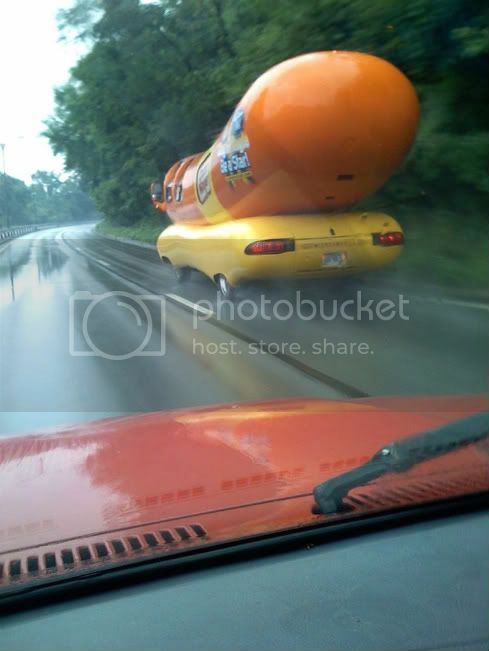 I relish the chase. Hey! Norm, where’s the relish? How are you today, my dear Art Institute of Pittsburgh students and downtown workers? Are we excited for the marathon this weekend that I’ll be winning with an hour to spare even though I’ve been training without my shoes? Now that the chitchat is out of the way, let’s make this easy and you guys tell me which one of you shoved the library’s copy of the Wall Street Journal in my mouth this morning while I was still sleeping. Sometimes you humans have no respect for the incredible destruction I could rain down on your toothpick-like bones. If you’re going to put something in my mouth while I’m sleeping can I recommend you place a meat of some sort? A scutellosaurus would be perfect. Or Matt Lamanna’s car. Or the unconscious body of whoever STOLE MY RUNNING SHOES! 2. Oh, FSN and The Great Outage of 2009 During Which Pens Fans All Over Pittsburgh Came Close To Descending On FSN Headquarters While Moaning BRAINS. BRAIIIIIIINS. 3. In comments to my post about the students being do-gooders this week, two people commented wanting to remind you students to complete your FAFSAs because you only have until next week to do it and if you don’t do it, you can kiss your financial aid money goodbye. Do it, because I told you to. Because I care about you. Because I will bite you if you don’t. See what you did? You made me resort to violence. I abhor violence. Never mind. I DIDN’T DO ANYTHING, NORM! 5. 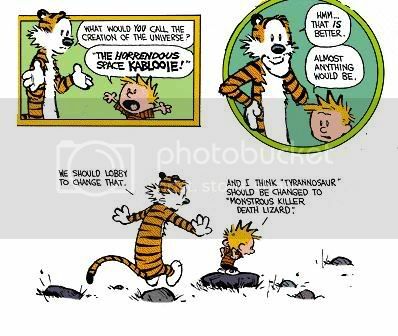 Why Calvin should be in charge of everything forever and ever. 6. If the giant T-Rex skeleton at the Carnegie crumbles to the ground this weekend, I have no idea what you’re talking about. Do you ever have that feeling that you’re being followed? I can’t put my finger on it, but something is different today. I don’t know about you, but I don’t recall breathing from the time the Flyers scored their goal until the time Max Talbot put one in the net during last night’s Penguins game. That was meteoric fireball intense. I would know about meteoric fireball intensity. Anyways, you seem skeptical. Luckily for you my mother emailed me some photos. First, here’s me with my team. As you can see it takes about a dozen human kids to stop me from eating Blor’s kid Blor. 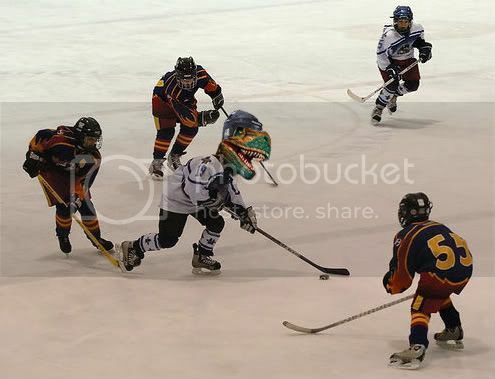 Here’s me in action doing Sidney Crosby type things 65 million years before Sidney Crosby’s existence. See that human kid #55 in front of me all crouching with his knees buckled together. That was the first time I realized I could make humans lose control of their bodily functions. That was a good day. 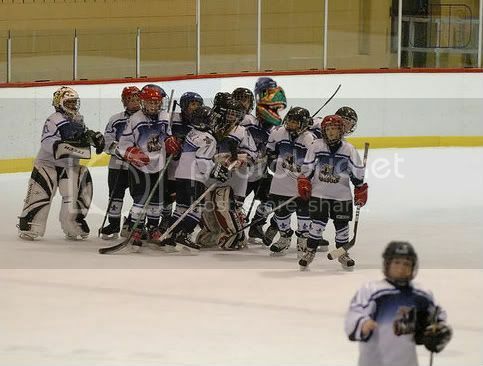 I’ll see if I can find more pictures from my hockey playing days to share with you soon! Also, I’m STILL not wearing any hockey gear and it’s making me look like a bad Penguins fan. Have you seen Norm lately? Was he feverishly sewing a giant Malkin jersey while openly weeping? Sorry no posting yesterday. I was busy helping the kids out with AIP’s Week of Service which runs through to Saturday. This is a whole week where the students are busy not only with school but also with helping out with volunteer projects. Yesterday we were collecting supplies for Light of Life. I got kicked out because too many donors would spot me, get all scaredy-cat and just hurl the supplies at us and run away screaming. Like I’m going to attack while I’M DOING CHARITY WORK! The students are also designing cards for the kids at the Children’s Hospital of Pittsburgh to give to their parents. How nice is that? In recognition of the students’ hard work in helping others, I’ve decided to be generous and kind this week and will give them an entire minute head start before I start chasing them down the Boulevard of the Allies. I know. Magnanimous is the word you’re looking for. 1. Why am I not wearing any Penguins gear? We are halfway through the first round of playoffs and I’m standing here COMPLETELY and UTTERLY NAKED! If this were football season, I’d at least have a dead raven or a mangled cardinal or a begging bengal in my mouth by now. 2. Norm won’t let me tweet on twitter, but he told me that Oprah recently joined twitter. What could she possibly have to tweet about? Oprah Made a gazillion dollars today. Oprah Spent a billion dollars this afternoon. Oprah Living my best life. Oprah Living my best life with the rainbow of fruit flavors of my chi. I mean, really. Some people don’t need to be on twitter. 3. Is Barney on twitter? 4. One of AIP’s own was profiled in the Tribune Review. 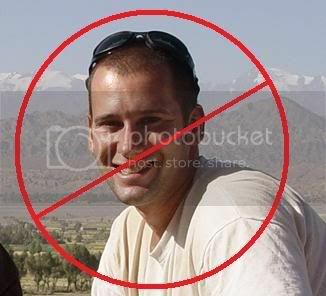 He is Barron Whited, the director of counseling. I bet he’s the guy Norm runs to when I make him cry. 5. 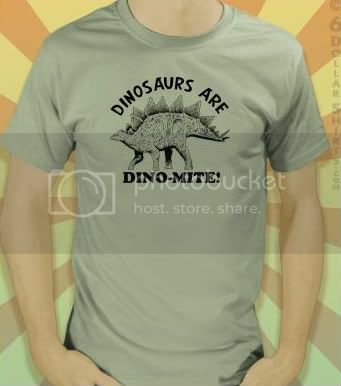 Ignoring the grossly minuscule size of the arms, here’s a really wonderful t-shirt you can get from Snorg. Also, that girl is cute. 6. Chasing a wild turkey the other day, I ran 10 miles in three minutes. This is stellar time, so I’ve decided to run in the Pittsburgh marathon. Which means I REALLY need to find those shoes or the person that stole the shoes. In the meantime, I’m running barefoot. Hopefully I won’t get injured because it would be just like Norm to take me to “Dr.” Matt Lamanna for treatment, and the next thing you know I’m a poorly assembled statue of rickety bones placed in his museum for the kids to look at.